Copies of AUSTIN car magazine from 1964 and 1965. Homepage. 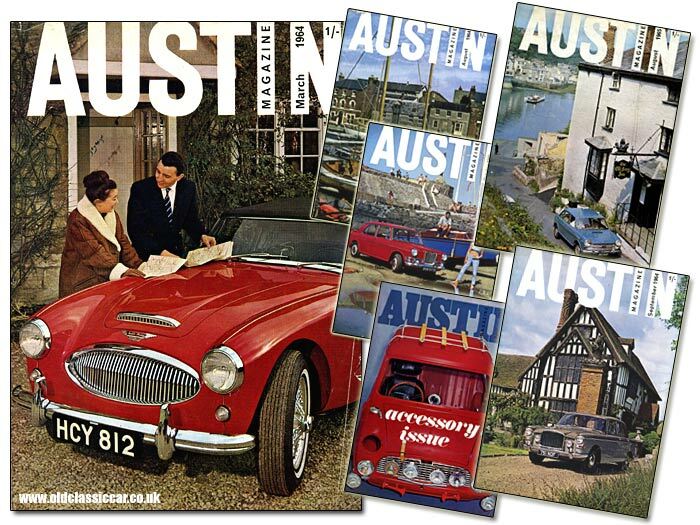 This page: A selection of in-house BMC motoring magazines, titled AUSTIN, from the early 1960s. AUSTIN magazine from the 1960's. For 1 shilling (5p) per month, anyone with an interest in BMC motor-cars could avail themselves of the monthly AUSTIN magazine. Despite the title, the AUSTIN magazine featured all the marques that fell under the BMC group's management, as the covers shown below clearly illustrates. The March 1964 issue features the new Austin-Healey 3000 MkIII, and the September 1964 issue the Vanden Plas 4 Litre R. August 1965's cover shows off the fwd Austin 1800, whereas October's issue features a charming young lady, eyeing-up a smart red Riley Kestrel. Most recent of the AUSTIN magazines I have is from April 1967. This final copy has a Mini bodyshell on the cover, accompanied by some of the exciting accessories that the budding home-modifier could order for their Mini. The magazines all feature general-interest articles within their pages, some relating to the current range of Austin/Morris/Riley etc cars on sale, and others to aspects of motoring, holidaying both in the UK and abroad, and letters from readers. The earliest copy I have dates to March '64, and it's this issue that will now be looked at in more detail. A look at the new Austin Healey 3000 MkIII. March's copy features a red Austin Healey 3000 on its cover, registration HCY 812, photographed by R.T. Beach near Abingdon, in Berkshire. A review of the updated Healey can be found on page 360, written by Ken Court. The MkIII's updated specification is covered, including the increased power of the revised "C" Series engine, and its all-new, more luxurious interior. Power was now 150bhp (gross), up from 136bhp of the previous MkII - a useful increase, thanks to a revised cam profile, and the fitment of twin HD8 SU carburettors - replacing the MkII's HS6 items. A photo of the previous model Healey, the 100/6, can be seen here. A test run up the M5 motorway in a new Colorado Red Healey 3000, certainly left Mr Court very impressed by the experience - and he also noted how much quieter the new car was to drive. This was largely thanks to a re-designed exhaust system, that now incorporated four silencers. Not only was the exhaust note quieter, but the system was also more efficient, helping the engine to breath more efficiently. But it wasn't only the car's grunt that appealed, he was also able to give the braking system a real-world test ... "The practical value of the improved braking was demonstrated vividly to me after a smart piece of right foot work as a result of a driver of an oncoming coal-laden lorry deciding to overtake a coach round a blind bend." The extra grunt of the engine, and comfort of the interior, were very much influence by the buying priorities of the Stateside motorist. In 1963 the big Healey had proved to be one of BMC's best-performing export models. In all, 91.5% of Healey production was sold overseas, most to North America. This is how Mr Court summed up his experience in the MkIII Healey: "This is the type of car that young men dream about, that married men wave on with a sigh as they motor down to the coast laden to the gunwales with holiday paraphernalia, and that retired businessmen wish that they had bought before rheumatism set in. Driving the MkIII, I could almost agree with the man who propounded the theory that fast cars are the answer to our overcrowded roads. The faster the car, he said, the sooner it leaves more road space for other, less fortunate mortals." The basic price of a Mk3 AH Sports Convertible in March 1964 was ï¿½915, or ï¿½1,106:3:9 including Purchase Tax. A Laycock overdrive would add ï¿½50 (plus PT) to the price, and wire wheels ï¿½25. A heater, an essential for any car in the UK, would cost an extra ï¿½15:10s, and a tonneau cover ï¿½10. Around the world in an Austin 7, 1928. It wasn't just modern cars that received glowing reviews in this issue, as three pages were given over to an epic journey made by Austin 7 in 1928. Miss Gladys de Havilland (of the aeroplane manufacturing family) decided that she's like to undertake an epic, around-the-world, drive, and be the first lady to achieve it. A word in the ear of Sir Herbert Austin, led to her being provided with a new Austin 7 Chummy. The first stage saw her drive across America. Although many roads were in good order, many were in very poor repair, with many miles through claggy mud being crossed by the plucky Austin and its heroic driver. After arriving in San Francisco, it was off in the direction of the Antipodes next, with the roads of New Zealand and then Australia tackled successfully. Mile after mile of back-breaking "roads" were encountered, where Miss De Havilland ".. anticipated any moment that the Seven would fall to pieces, so intense was the shaking to which it was subjected over the rock-strewn roads." The roads in India were found to be in good condition for the most part, and it was the intense heat if anything that proved to be the real challenge, for both car and driver, on this leg of the journey. Europe too was covered with little fuss, the car arriving back in England, via Italy and France, in one piece. 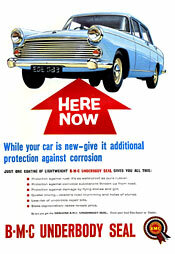 If ever there was good publicity for a car's dependability and reliability, this was surely it. In 1962, John Coleman would complete a similarly gruelling trip, this time from Buenos Aires to New York, also in an Austin 7. He'd then go on to write a book about his adventures, but the story of Ms De Havilland and her 1928 Austin, at a time when the car was still on sale, mustn't be forgotten either. I wonder where her car ended up? Is VP 2709 still around somewhere? The letters page contains thoughts on a number of topics, ranging from one reader who believed that mud flaps should be fitted to all new cars, to a letter from Alf Depper, correcting various points made in a previous article about the racing of Austin 7s by the factory. A lengthy article looks a how to go about buying a used car, and another considers the 848cc Mini and whether 1p-per-mile motoring was attainable. Return to the car magazines section for information on similar magazines. Enthusiasts of BMC vehicles may find the page devoted to Worldwide magazine, a publication sent to Austin distributors around the world, of particular interest. Following the creation of BLMC, many of these marque-specific magazines were dropped, to be replaced by the company's own High Road publication.